As I have bemoaned in the past, good QSL card designs are hard to come by. This is my attempt to remedy that situation. The front has my callsign, with a QR code linking the interested recipient to this web site. The reverse is postcard-friendly with space for six QSOs, corresponding to 1.8/3.5/7/14/21/28 or 50/144/222/432/903/1296 MHz. The address space can be used for a personal note if the card is mailed in an envelope. The card is also QTH-unaware. This means that I’ll have to write or sticker my way along, but I won’t be limited by my moves and travels. The font is Gil Sans everywhere. The cards were laid out using Adobe Illustrator CS4 and printed on 100-lb matte cover stock by Carlisle Printing, who printed my last cards as well. One final note: one week after SS CW, I am already up to 43/50 states for my CW WAS from Maryland using LoTW. I’m not sure how many of these QSLs will actually make it into circulation at this rate. Be sure to work me so you can have your own copy of this rare collector’s item! If you have come to the site checking to see if I am still alive because you have not received a QSL card via the bureau system, you have come to the right place. 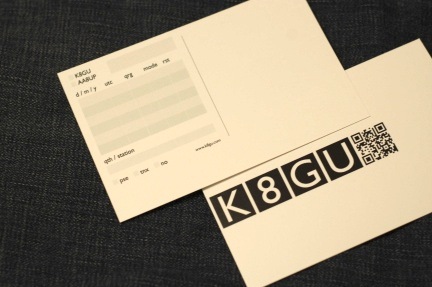 I finally mailed about four years worth of CE/K8GU, KP4/K8GU, PJ2/K8GU, and K8GU bureau cards out this week. (Yes, it was a nice-sized pile, but not as big as it could have been.) There are a few recent requests that have not been filled because I ran out of CE/ and KP4/ cards. I will get some more soon.